Developing a farm stay of any kind requires a full family commitment and diligent homework on several different fronts, not the least of which are zoning, building and health code permits; insurance; financing; accounting; activities; and marketing.You’ll need to consider setting policies for reservations and cancellations, on-farm rules, safety standards, and, if you plan to hire help, hospitality training and labor management. 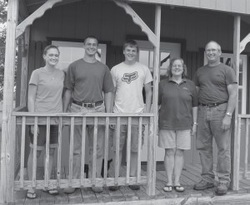 Stanley and Sharon Horning opened the Country Cousins Farm (http://www.countrycousinsfarm.com) cabin to guests in May 2012, six years after Stanley first read about farm vacations and began considering the idea of offering overnight accommodations. The Evans Mills dairy farm, milking 58 to 60 cows, is located in New York’s Thousand Islands region.